Recently, I received an email from a woman that had gotten a "Persian, " but she felt that the kitten did not have the same type of coat she was used to in the Persian cats she had owned before. She wanted to know if perhaps she had been sold a longhaired Exotic. So, I began my quest to learn more about the Exotic breed. First and foremost, an Exotic Shorthair is NOT a short-coated Persian. The roots of the Exotic are from breeding Persians to American Shorthairs, British Shorthairs, Russian Blues, and Burmese. The Exotic Shorthair is similar to the Persian breed in many ways, including temperament (but Exotics tend to be more active and inquisitive than a Persian) and conformation (except it has a short, dense, double - "undercoat"). Due to this double coat, they shed a lot! In the late 1950's, some American Shorthair (ASH) breeders decided to outcross to the Silver colored Persian cat to "improve" the ASH breed by bringing in the silver color and green eyes of the Persian breed (yes, silver Persians do have green eyes). In 1966, Jane Martinke successfully got the Cat Fanciers' Association (CFA) to recognize this "new breed" under the name Exotic Shorthair, and they were shown in the Exotic Shorthair classes – NOT the Persian classes. Initially, this new breed was to be named "Sterling" after their silver coat color, but it was finally determined that the official CFA name for this "new" breed was to be the Exotic Shorthair. Once CFA recognized the Exotic Shorthair, many breeders continued to outcross with the Russian Blue and the Burmese. This posed a problem as the CFA had accepted the Exotic Shorthair based on the lineage before the introduction of the Russian Blue and Burmese. Therefore, in 1987, CFA declared the only "allowable" out-cross breeding to an Exotic Shorthair is to the Persian. Due to the many out-crosses to the Persian breed, some Exotic Shorthairs carry a copy of the recessive, longhair gene. If both Exotic Shorthair parents carry the recessive gene for longhair, kittens in the resultant litter have a one in four chance of being a longhair which is why you have longhair and shorthair coated kittens in the Exotic breed. For a more in-depth article on the Exotic breed visit the CFA website. As you can see by the first picture of an Exotic Longhair, an Exotic Shorthair, and a Persian, they are very similar to the look of a Persian cat. In fact, the picture of the Exotic longhair kitten looks just like a Persian. So, how do we tell the difference? 1111-11111111. The first four digits (before the hyphen) denotes the color classification and breed. My cat Dignity – has a registration number that begins with 1142 which denotes that he is a Brown Tabby & White Persian. The color classification and breed registration numbers for an Exotic range from 7340 to 7992. The Exotics are the only breed in this range of numbers. So what does this all mean? Well, if you are buying what you think is a purebred Persian cat or kitten and its registration number falls within the range of 7340 to 7992, you are in fact purchasing a long-haired Exotic and not a pure Persian. This frequently happens as the Persian breed is the most recognizable breed in the world and the most popular breed in the United States. Why is this a common problem? Exotic breeders (as well as other breeds) have a much smaller population of potential customers to provide good homes for their pet-quality kittens. 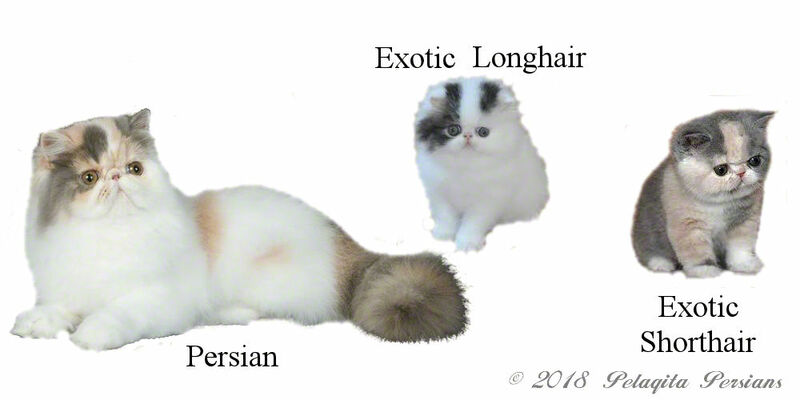 Because the CFA Breed Standard for both the Exotic and the Persian are almost identical, irresponsible and unscrupulous breeders often try to pass off long-haired Exotics as Persians to get them into homes and at much higher prices! If you are looking for an Exotic (whether it be a long or shorthaired version), ask to see the registration papers to determine if the registration numbers fall within the 7340 to 7992 range. If the breeder says they haven't registered the litter yet or haven't gotten the papers yet, then ask to see the registration certificates of the parents. Again, if the first four digits fall within the 7340 to 7992 range, then it is an Exotic kitten (whether longhaired or shorthaired). Conversely, if you are looking for a pure Persian (meaning no Exotics in the lineage), then check the registration papers. The range of the first four numbers on the registration certificates should be between 0100 and 3498. Checking the registration numbers is the ONLY way to know for sure if you are buying a Persian or a longhaired Exotic.